For decades, climbing helmet design revolved around a hard shell with a suspension system that allowed it to float an inch or two off your head. This design protects well from falling rocks, ice, carabiners, cameras, etc., but not so well from side impacts that can occur when a falling climber slams into a hard surface. Unfortunately, whipping the back of your head into the cliff can be a real risk if you find yourself taking a lead fall with the rope caught behind your leg. I remember thinking about this when my dad made me wear my old Petzl Ecrin Roc: I'm the one leading all the pitches; what good is this plastic shell going to do if I hit the side of my head in a fall? I was only 13 years old, but I knew intuitively that the helmet was not going to protect me from much else besides falling debris. Then foam helmets came along. They were lighter and protected you from impacts but they were quite fragile—you had to be careful not to drop them while placing them inside the car or a backpack because they might crack when they hit the ground, rendering them useless. They were basically a one-and-done deal. For this reason, I continued using my old Ecrin Roc for ice climbing, when ducking chunks of ice is the norm and the helmet is likely to take all kinds of abuse throughout a single day. Climbers no longer have to choose: we now have foam helmets with hard shells. And the Grivel Stealth Hard Shell is one of the burliest and lightest designs on the market. The Grivel Stealth was made with ice climbing and alpinism in mind—it can take knocks and will stay intact. It was clipped to the outside of an over-filled haulbag last October when I stumbled and fell down hard on the trail, with the heavy bag falling directly on top of the helmet. The shell has some scratches to show for it but otherwise the helmet still seems perfectly usable. My Black Diamond Vector—another foam helmet with a thin plastic "skin"—most likely would have busted like an egg in that situation. The Vector is also designed to sustain more than a few knocks, but the shell is noticeably softer; I once ripped a brass nut when I took a short lead fall on a climb in Indian Creek, and the quickdraw attached to the nut zipped down the rope and snapped me in the dome, leaving a shallow dent in the helmet. My Vector also has several little dings from the moments when I stood up a bit too fast and bonked my head on the underside of a roof—it would not hold up well in an ice-climbing situation, but I was often tempted to use it anyway because it was so light and comfortable. Now I have the Grivel Stealth Hard Shell, and I'm happy to have something that is burly and lightweight. The Stealth comes in a few varieties (five total, if you count color options). The Stealth Yellow/Titanium is the lightest version at 190 grams, and is made with polycarbonate plastic; in terms of weight and material, this version is comparable to the Black Diamond Vapor. Then there is the Grivel Stealth Carbon, which has a carbon-fiber shell and weighs 210 grams. The version I have is the Stealth Hard Shell (HS), available in yellow and white, and made with Acrylonitrile Butadiene Styrene (ABS) plastic; it weighs 292 grams, about 50 grams heavier than my Black Diamond Vector, which has a polycarbonate shell. Frankly, I don't really notice the weight difference between either helmet when I'm wearing them, but there is a difference in fit, which I'll get to shortly. Part of the design that makes the Stealth so strong is that it has a slightly different shape than that of a traditional brain bucket: what the company refers to as a "multifaceted design." Instead of a smooth, rounded surface, the shape is composed of flat, triangular planes that "add rigidity" to the shell and allow the plastic to be thinner (lighter) because of the trusses that contribute strength by dispersing impacts along the surface. Another benefit to the flat planes on the shell is that the helmet is less likely to roll away when set down on its crown. Some other reviews of the Stealth note that the four headlamp clips have a very tight fit around an elastic strap, making it harder to get a 'lamp in position around the helmet. I had to focus and be very deliberate when mounting a headlamp to the Stealth, but it seemed about the same as I would expect from my other helmet, and the secure fit gave me piece of mind while I was jumaring and cleaning gear in the dark during my solo trip up Prodigal Sun (V 5.7 C2, 900') in Zion last October. The reason I'm rating the Stealth as four stars instead of five has to do with the strap system and one-size fit. At 56 centimeters in circumference, my head is on the small side of the "medium" category for several brands. The Stealth is made in one size that fits a range of 55 to 61 centimeters. It fits me OK but remains a tad wobbly on my head. For comparison, the Vector has an adjustable plastic stabilizer on the back that keeps the fit more secure, and it has a slightly lower profile in general, making it my first choice for rock climbs where I'm wearing it mostly to protect me in the event of a fall. The plastic stabilizer sometimes gets in the way, however, when I'm trying to stuff the helmet into a backpack or strap it to the outside. The Grivel Stealth does not have any large plastic parts in its suspension system. Instead, it utilizes a decently well-designed web of nylon straps to keep the helmet in place, which shaves weight, makes it easier to pack, and offers one less piece that might be vulnerable to breaking in the event it's mistreated. One more benefit to the Stealth's lack of a plastic stabilizer is that it accommodates a ponytail more easily. That's all great. But it can be frustrating to adjust the straps to get a proper fit that keeps the helmet from sliding off the back of back of your head. During my three days on Prodigal Sun, I occasionally had to stop and fiddle with adjustments that had been knocked out of alignment, particularly with a yellow strap that goes around the occipital bone (lower back of the skull) and keeps the helmet in a forward position. Meanwhile, the front chin strap is in a fixed position, which leaves a bit of slack where it crosses my temples, and the tension from the connecting rear straps result in the chin strap tugging on my Adam's apple more than I'd like when I tilt my head forward, which I would classify more as "lightly irritating" than "uncomfortable." Is the Grivel Stealth perfect? No. Is it a durable, light and versatile option for ice, rock and alpine climbing? Absolutely. Especially if you have a medium- to large-size head. 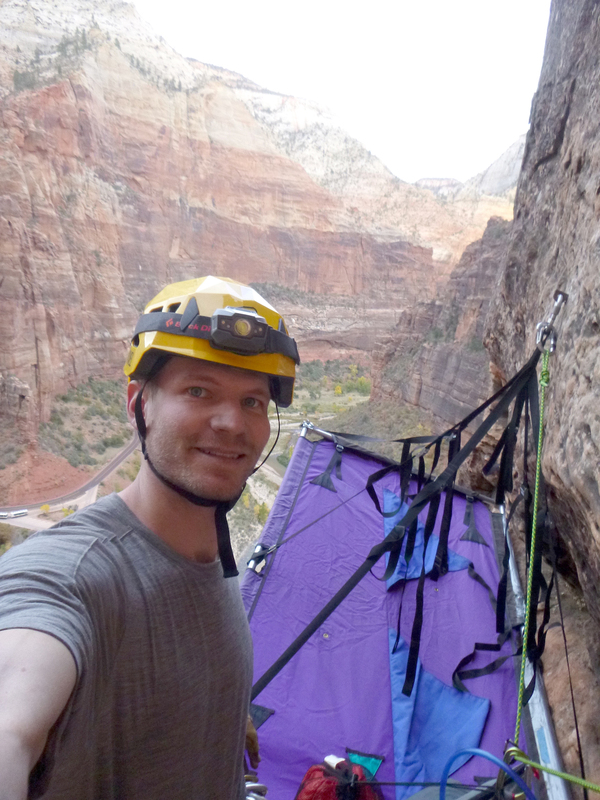 Derek Franz got his first climbing helmet for a windy trip up the Grand Teton at age 13. 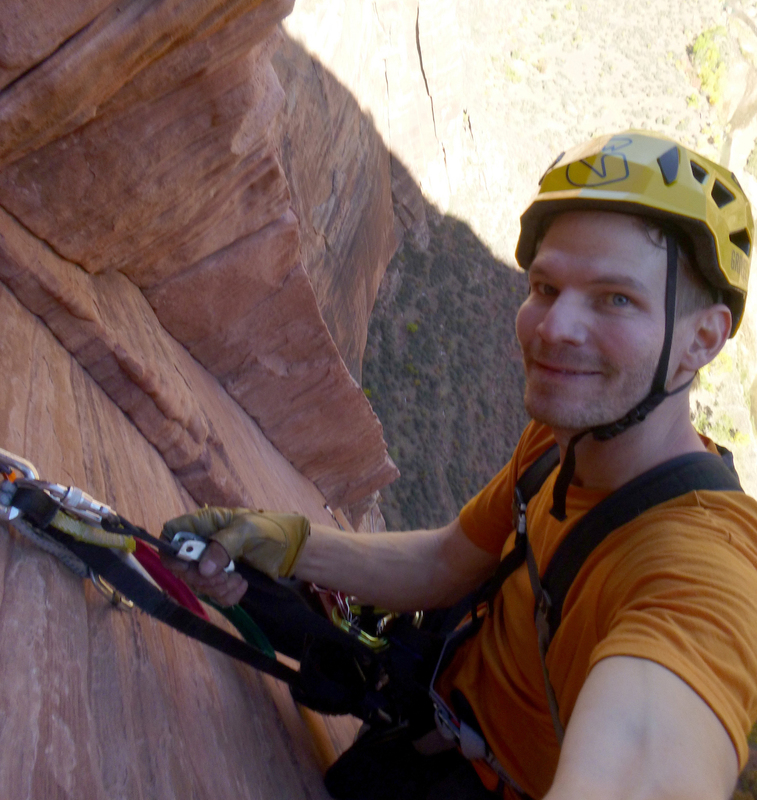 He is the digital editor for Alpinist.com and wrote a feature story titled "Glimmers in the Dark" for Alpinist 61 in which he remembers his friend Hayden Kennedy during a solo adventure on Prodigal Sun in Zion National Park shortly after Kennedy's death. Alpinist 61 is currently available on newsstands and in our online store. Straps that keep the helmet from sliding off the back of the head sometimes get pulled out of alignment and need to be readjusted.